Cheeeeese: that one word alone causes our stomachs to rumble and mouths to water. The sheer variety of flavors and textures created by only a few ingredients—milk, salt, enzymes, and microbes—is astounding: hard and soft, creamy and crumbly, richly umami and sweetly savory. For thousands of years, humans have been transforming animal milk into one of the most diverse and delicious substances in the world. But what is it about milk that makes it so uniquely suited to this particular magic trick? And why is it so hard to recreate using non-animal-based substances? This episode: real cheese, vegan cheese, and the real vegan cheese of the future. Cheese's fabulousness all begins with a particular protein: casein. Kantha Shelke, food scientist and head of the company Corvus Blue, a food science and research firm, told Gastropod that "we've got a few wonder proteins in nature, and casein is definitely one of them." One particular type of casein has special little tails that hold onto water, which is the glue that stops milk from splitting and makes it a liquid. But if you add the enzyme chymosin to milk, it cuts the tails off those casein molecules, allowing the protein to all clump together in curds. 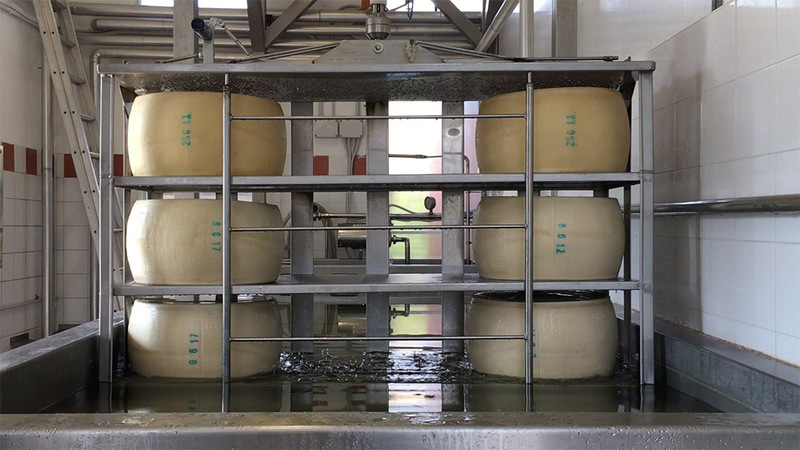 This is the beginning of milk's journey to become cheese, a process we saw in person at the Istituto Lazzaro Spallanzani, an agricultural and cheese-making school near Bologna in Italy. A master cheese-maker at the Istituto Lazzaro Spallanzani, adding whey to local milk and then feeling the curds with his hands as he makes Parmigiano Reggiano. Photos by Nicola Twilley. Casein's unique structure also contributes to the stretchiness of cheeses such as mozzarella and the smoothness of cheeses such as brie, and it is the secret to cheese's sensuous meltability. Like many vegans, Miyoko Schinner, founder of the vegan cheese company Miyoko's Kitchen and author of Artisan Vegan Cheese, found that cheese was the one thing she really missed when she gave up dairy. She was such a cheese fan that she'd even traveled Europe sampling the continent's thousands of small-batch, artisanal cheeses, before she realized that her constant stomach-aches might be due to a dairy intolerance. Out of desperation, she started to develop her own nut-milk substitutes. In order to replicate the taste, texture, and meltiness of cheese, she spent years experimenting with different types of nut milks, different methods to cause the proteins in the milks to clump together, different cultures to age the cheese, and, finally, additions such as starches and oils that would allow vegan cheese to melt. We at Gastropod sampled some of her results, along a few of the other vegan cheeses available in stores today: how well do they compare to the original? This episode, we also talk with Maria Chavez, executive director of a community biotech lab called BioCurious and a member of the Real Vegan Cheese project. She is leading a group of volunteers in California in an open-source effort to genetically engineer yeasts so that they will produce casein. Their ultimate goal is to create a cheese substitute made from animal proteins, with no animals milked in the process. And once you've genetically engineered yeast to produce casein, why stop with dairy? Will one of the vegan cheeses of tomorrow be made from narwahl milk? Listen in for more! Kantha Shelke is a food scientist and founder of Corvus Blue, a food research and consulting firm, as well as a visiting professor at Johns Hopkins University. She is passionate about food science and technology, and, of course, cheese. Miyoko Schinner founded her vegan cheese company, Miyoko's Kitchen, because she couldn't find vegan cheeses that met her standards. Today, she's recognized as one of the leaders in the vegan cheese industry. Her cheese is widely available around the country, though we weren't able to find her award-winning Mt. Vesuvius Black Ash in our local stores. She also published the cookbook Artisan Vegan Cheese: From Everyday to Gourmet. The Real Vegan Cheese project began in 2014, with volunteers working together to try to coax yeast to generate casein, the main protein in dairy milk and the most crucial protein for cheese production. Maria Chavez says the team is close to meeting their goal, though she acknowledges that producing casein is only the first step to real vegan cheese. We also spoke with Rebecca Wilbanks, who was part of the team from 2014 to 2016, and whose paper, "Real Vegan Cheese and the Artistic Critique of Biotechnology," gets into some of the fascinating issues the team faced, for example, in thinking about intellectual property. On our ridiculously overbooked reporting trip last summer, Toni Mazzaglia, owner of the tour company Taste Florence, convinced us to get up super early to watch authentic Parmigiano Reggiano being made at the Istituto Lazzaro Spallanzani, an agricultural school just outside Bologna. We might have been sleepy, but we were enthusiastic! For two hours, we marveled at the different stages the milk went through before it finally was shaped into rounds and ready for aging. And, of course, our visit was capped by a breakfast of fresh ricotta, as well as samples of 12-, 24-, and 36-month-old parmesan. Plus, just for fun, we washed it all down with some lambrusco, the local sparkling red wine. Yes, at breakfast. Thanks again to Toni for planning it and for translating. If you have a trip planned to Florence, take her food tour. And a few lucky Gastropod listeners can enter code gastropod18 to get $5 off per ticket. You won't regret it! The morning's milk arriving at the Istituto Lazzaro Spallanzani. Photo by Nicola Twilley. The parmesan stork has arrived! Photo by Nicola Twilley. 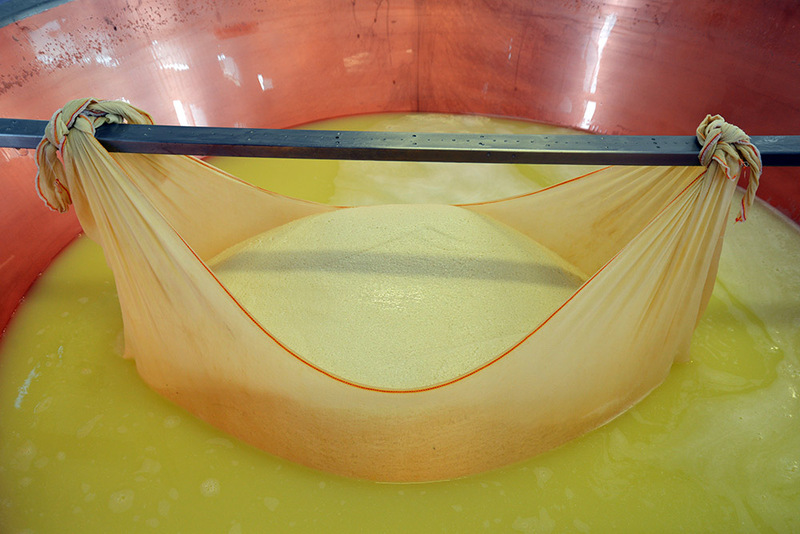 Rounds of parmesan being lowered into the brining pool on a cheese elevator. Photo by Nicola Twilley. 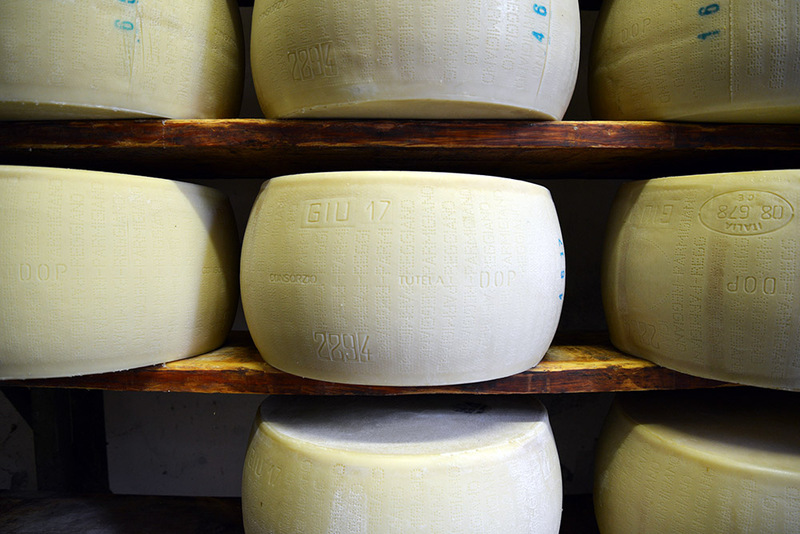 Young rounds of parmesan begin the aging process in a refrigerated cheese cave. Photo by Nicola Twilley. The artwork that accompanies this episode is part of an infographic on cheese meltiness designed by captivater and published here.